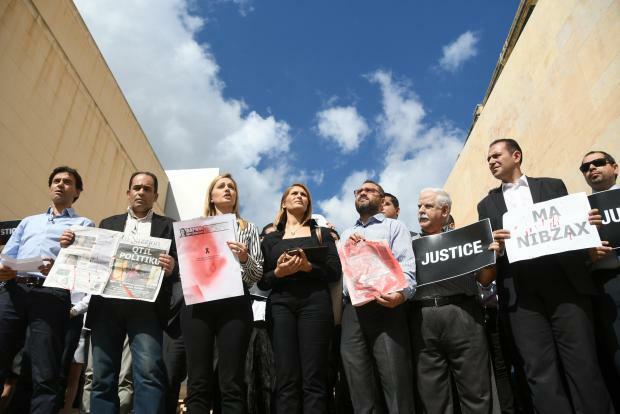 Maltese media held a march days after Caruana Galizia's murder. The brutal killings of investigative journalists Daphne Caruana Galizia and Ján Kuciak came as tragic reminders that Europe remains a dangerous place for journalists. How European states respond to these murders will shape not only the future of the press, but also that of our democracies. A look at available data helps us understand the seriousness of the situation. In the past 12 months alone, six journalists were murdered, half of them in the EU. Since 1992, over 150 journalists have been murdered on our continent, one every two months. Some were covering wars, but the majority were murdered while trying to spotlight the dark corners where corruption, crime and politics converge. Many of them had solicited police protection, but State authorities ignored these requests. If murder represents the extreme, most visible way to silence journalists, other pernicious, less noticed threats also take a toll on their freedoms and safety in Europe. A report that the Index on Censorship and the European Federation of Journalists published recently shows that 220 journalists were detained or arrested in 2017 and over 1,000 cases of limitations of press freedom occurred, often at the hands of State agents. Since 2015, the Council of Europe has received over 160 alerts of attacks, harassment and intimidation against journalists, and a 2017 survey showed that many journalists resort to self-censorship to avoid problems. This toxic atmosphere poisons democracy. Attacks against journalists – whether prominent investigative reporters or precarious freelancers – always go beyond the individual case and concern us all. If journalists cannot work freely and safely, it becomes more difficult to unearth human rights violations, corruption or the misuse of power. The public receives less information than it needs to actively take part in the decision-making process. And undemocratic forces thrive. This is why press freedom represents a well-established human right in international treaties, national laws and constitutions. As the European Court of Human Rights has underscored in several judgments, States have the obligation to uphold it and protect journalists’ lives. If they fail to protect them, States remain under the obligation to carry out effective investigations into the killings and to punish the culprits. Regrettably, European states fail to live up to these obligations all too often. Take investigations into crimes against journalists. They often drag on for years, and while the actual perpetrators are sometimes brought to justice, those who mastermind such crimes are rarely punished. Such a failure inflicts additional pain on journalists and their families, and fosters a sense of impunity that paves the way for further attacks. If States care about democracy and the rule of law, they must become more serious in implementing the human rights standards that they have adopted on the safety of journalists and other media actors. They must turn words into action. A starting point is the recommendation that all 47 Member States of the Council of Europe signed up to in 2016 – and this includes all EU countries. The text provides concrete measures to fulfil States’ duty to protect the lives of journalists and to end impunity for crimes against them. I see in particular three steps that States can and must adopt in the short-term. First of all, ensure protection. Police and law enforcement officers must not overlook threats against journalists nor neglect requests for protection. Some countries have good expertise on how to ensure police protection, and they should share it with others. Increased cooperation with international organisations, journalists’ organisations and independent observatories on violence against journalists would also help increase States’ ability to protect them at an early stage. Secondly, end impunity. The police and the judiciary must be able to investigate all cases of violence against journalists, including those involving State agents, and prosecute the perpetrators. This requires a well-trained and effective police force and a truly independent judiciary, free from political influence and able to prosecute the highest spheres of the State if need be. Thirdly, change legislation. Lawmakers must implement legislation that protects journalists and shields them from undue pressure. When it comes to defamation and libel, they should fully decriminalise them, foresee only proportionate civil sanctions and provide penalties for those who abuse defamation suits to silence journalists. Laws tackling disinformation, terrorism or security issues must avoid limiting journalists’ freedoms and safety. These measures are within reach, provided there is political will. Here we get to the heart of the problem. At best, many politicians remain indifferent about threats to journalists. At worst, they instigate violence and instil press distrust. This hostile attitude must change: politicians must protect, not bury, press freedom. The murders of Daphne Caruana Galizia, Ján Kuciak and other journalists were not due to fate but to structural deficiencies in institutions that should have protected them. This situation endangers journalists as much as democracy. It is high time States acknowledge it and ensure the safety of journalists and other media actors. Dunja Mijatović is the Council of Europe Commissioner for Human Rights.